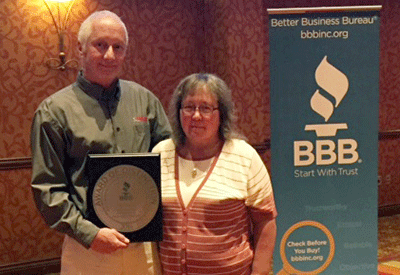 Omaha, NE (November 7, 2016) Two Omaha CARSTAR locations were recognized with a “Silver Award of Distinction” at the annual Better Business Bureau (BBB) Integrity Awards Event held on Wednesday, November 2, at the Embassy Suites Conference Center in La Vista, NE. This award recognizes organizations in metro Omaha that have demonstrated ethical practices with key stakeholders including customers, employees and community at large, rather than a company’s growth, profitability or popularity. Margo Riekes, Communications Director of Nebraska BBB, said these two Omaha body shops were selected because their application demonstrated that integrity is important for success and profitability and that business ethics were integrated into their corporate culture. The two CARSTAR locations in Omaha are owned by partners Greg Petersen, Bob Keith and Tim Jensen. Silver Hammer CARSTAR was founded in 1979 and is located at 4827 No 90th St. Northwest CARSTAR was opened in 1996 and is located at 3304 No 120th St. Both CARSTAR locations are part of the CARSTAR franchise network which is the largest group of branded auto body shops in North America. The judges decision was based on the score of CARSTAR’s application compared with the others in the judging category of 25-99 employees. These locations also received this award in 2014.